A heartfelt thanks for all of the birthday wishes! My year of yoga is underway. It actually started the day before my birthday at a retreat on Bainbridge Island. My friend Jen, yoga instructor extraordinaire, plans to host one of these a quarter and I am already excited about the next one. I have known Jen since 7th grade and she is one of my favorite people. She is a part of the supper club I put together 4 1/2 years ago, and she is one of the best listeners I know. I have done so many things with Jen at all different phases of my life, but I had never taken a yoga class with her. I now, more than ever, wish she was much closer than a ferry ride away. I would be at that studio everyday if I could be. Oh yes, the food. Because I wanted to take part in the morning class, I needed to make most everything in advance. Last time, I spent about 2 hours putting it all together. This time, I only had an hour. I decided to make some tofu wraps, a dip, a trio of salads, and two kinds of cookies. When I got to her house, everything was done except assembling the wraps and tossing the green salad. The most talked about dish, aside from these cookies, was the chickpeas. Women after my own heart. If you are new here, let me tell you that I love chickpeas. I love them every which way. 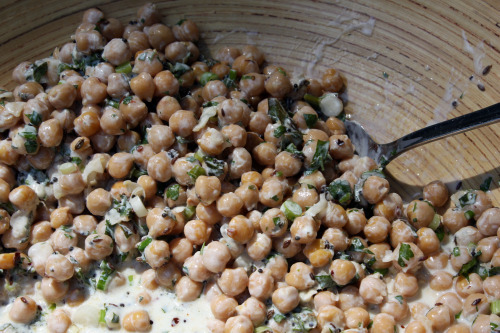 If you do too, this is an especially nice dish because the dish truly stars the humble chickpea. There is not a lot to distract you from how wonderful they are, but with lots of flavor to boost them up. 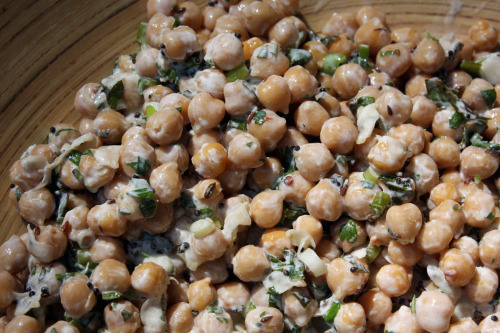 Chickpeas are poured into a bowl, a spice oil is made and poured over the beans, then yogurt, green onions, lemon juice, and lots of herbs are folded in. It is a quick and simple dish that does not suffer from an overnight visit to the refrigerator. Just be sure to serve it at room temperature so the flavors bloom as they should. For the rest of this week, I will most likely be posting recipes from the retreat. You see, it is too hot to cook here in the Pacific Northwest. If you are the type who watches the weather, or if you are on Twitter (are you? Follow me! ), you will know that we are experiencing a heat wave here in Seattle. It is going to be above 90 degrees all week. If I make anything, it will most likely be a giant salad, but I predict we will be eating takeout and ice cubes until this is over. Pour the chickpeas into a large bowl. In a small skillet, heat the peanut oil until shimmering. Add the mustard seeds, partially cover the skillet and cook over moderately high heat until the mustard seeds stop popping, about 1 minute. Add the cumin and fennel seeds and the crushed red pepper and cook until the mixture is fragrant, about 30 seconds. Pour the hot oil and spices over the chickpeas. Stir in the yogurt, lemon juice, sliced scallions, chopped cilantro and mint and salt. Serve the chickpea salad at room temperature. Although I have been cooking and baking a lot in the past two weeks, it has been nice to have a break from the familiar. I essentially took two weeks off from my clients and just cooked whatever I wanted (or didn’t cook!) for my family. Every time I have that luxury, I immediately want to make red lentils. I actually have two favorite recipes for these little beauties and I could have sworn I already shared one of them. But after looking through past posts, I cannot find it anywhere. Whenever it is time to pull these recipes out, I can never remember which one I like better. One has zucchini and coconut milk, the other has carrots, spinach and no coconut milk. Both have Indian spices and seasonings (lots of ginger and garlic), both are extremely tasty and good for you. Both are incredibly well accompanied by roasted cauliflower. If you think you don’t like cauliflower, please – oh please – give roasting it a try. Just cut a small head of cauliflower into bite size florets and toss with a sprinkling of olive oil, salt, and pepper. Bake in a 450 degree oven for 20-30 minutes. Toss once to make sure it browns evenly. You want it really brown. If you happen to have a dark colored baking sheet in your house, now is the time to use it. You will win friends and influence people with this dish. I kid you not. But back to the lentils. I will give the recipe for the the carrot one today in the hopes I will unearth the other one from a past post at a later date. While this recipe does not call for coconut milk, I decided to add some and then, on tasting it, decided it was too sweet. So here is the original. I found the other recipe – it’s here. Serve this stew over basmati rice. Heat a heavy 4-5 quart pot over moderate heat and then add just enough oil to coat the bottom. Cook the onion with a sprinkling of salt, stirring occasionally, until golden, about 8-10 minutes. Add ginger and garlic and cook for 2-3 minutes more. Add spices and cook over low heat for 1 minute. Stir in lentils and 5 cups of water and bring to a boil. Reduce heat and simmer, covered, stirring occasionally, for 10 minutes. Add carrots and another sprinkling of salt and simmer covered, stirring occasionally, until carrots are tender and lentils have broken down into a coarse puree, 15-20 minutes. Stir in spinach and peas and simmer, uncovered, stirring occasionally, until peas are tender, about 3 minutes. Stir in cilantro and season stew with salt and pepper. If necessary, add enough water to thin stew so that it can be ladled over rice. 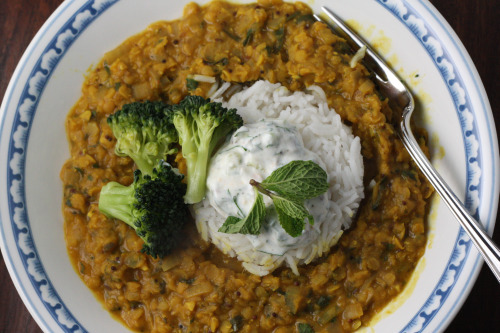 One of the joys of cooking and eating vegetarian is exploring world cuisines. Many of the world’s cultures eat either don’t eat meat, or eat it sparingly – as more of a condiment than a focus. If you are a little adventurous, you can find incredible and satisfying vegetarian food in cultures other than our own. I’m not sure where I first had it, but I have always loved Indian food. Unfortunately, living in Seattle, I had never had really good restaurant Indian food. In my opinion, what you find here tends to be very oily, rich, and – for lack of a better term – gloppy. 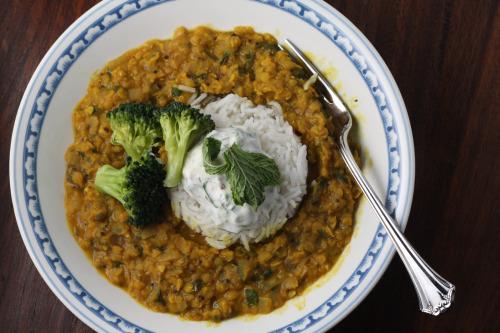 Early in my cooking life, I instead turned to recipes that involved curry and devoured them. Periodically, I would try an Indian restaurant and would eat a ton of naan and then get a stomachache from the rest – just too much oil for me. And then Randy and I went to Spain for our honeymoon. In typical Randy fashion, he was able to finagle a side trip to Paris and London so he could do some meetings and I could make it back to Paris for the first time in 12 years, and see London for the first time. (Randy is the master of making the most out of a travel schedule.) It is now hard for me to believe that in the first 32 years of my life, I had never been to London. Randy had been there many times without me for business and somewhere along the line, someone took him to Rasa and he knew at first bite that he had to take me there. I have stated this in more round-about ways in previous posts, but Randy is not a foodie. Until he met me, he was of the food-is-fuel mentality. He didn’t really care what he was eating, just as long as it was nutritious and tasted decent and kept him from bonking. (Full disclosure: his “bachelor meal” is rice, tuna, salsa, and cheese. He still eats this if I am out.) So the fact that he loved this restaurant and knew I would love it, well, that’s the kind of thing that made me marry him. Although Seattle is no culinary capital, I have always been a good and curious eater. My parents are both from New York and I grew up going there at least once a year and in typical fashion for my family, food was the focus. Early on, I learned to love the many different types of Asian food that are represented so well here in the Northwest. But I had never had South Indian cooking and what I tasted at Rasa blew my mind. This is a gross generalization, but the cooking in the South tends to be lighter, spicier, cleaner, and has far less meat. Much of it is vegetarian or uses fish as a protein. The Rasa that we ate in (there are several) was, at that time, vegetarian. So imagine me, so used to getting the short end of the stick in restaurants, sitting in front of a menu with the most incredibly interesting and incredible sounding food – all of which I could eat. I almost cried. We ended up getting a tasting menu and I can honestly say, I have never been so full in my life. I literally could not stop eating everything they put in front of me. Everything was spiced perfectly, seasoned perfectly, balanced perfectly, and looked beautiful. Randy bought me the cookbook and I couldn’t wait to get home and start cooking. Not quite a year later, we had the opportunity to move to London for Randy’s job. We went on a househunting trip and guess where we ate. Guess where we ate for my birthday dinner. Guess where we ate on a pretty regular basis. I couldn’t get enough of it. We brought our friends Michelle and Dale there thinking that if we stuck to the less spicy dishes they would like it. They didn’t – too spicy. But it remained my favorite place in London. Whenever I want to make Indian food now, I pull out my two Rasa cookbooks. Many of the recipes use fresh curry leaves which are difficult to find. The one place I did find them in Seattle was at Uwajimaya – an incredible Asian superstore in the International district of Seattle. It is far from our house, but totally worth the trek because the flavor of the curry leaves is unparalleled (they have nothing to do with curry powder). They look like small fresh bay leaves and have a pungent taste – almost rubbery. This may sound unpleasant, but truly they impart the most round flavor to every dish they inhabit. The last time I went to Uwajimaya, I was told that they could no longer carry them because there was a U.S. ban importing them. I’m not sure if this is true because peeking around the internet just now, I saw plenty of them, but suffice it to say, that while I made Indian food last night for my clients, I didn’t use my beloved Rasa cookbooks. Instead I used three trusted recipes from food magazines that I cut out long ago. One of them is Creamy Eggplant with Green Peas. In the Vegetarian Rule Book, one of the top requirements is that you like eggplant. I have never been a big fan, but it falls under the “Don’t Like it Much, But Will Eat It” category instead of the “Don’t Like It and Won’t Eat It”. (I think the only thing on that list is okra.) This eggplant dish I not only eat but I enjoy it. The eggplants are first roasted at high heat and then mixed together with lots of spices, tomatoes, onions, peas, and yogurt so it becomes creamy and takes on the complex flavors that are in the dish. It is relatively easy, nutritious and very tasty. A friend mentioned that she has seen curry leaves at R & M Grocery in the University District, so next time, it’s back to my Rasa Cookbooks! 1. Preheat the oven to 500 degrees. Put the eggplant on a rimmed baking sheet and pierce them all over with a knife. Bake for about an hour, or until the skin is blackened and the flesh is very soft. Let cool slightly. Peel off the skin and scrape the flesh into a large bowl. Mash the eggplant coarsely. 2. Meanwhile, heat the a couple of tablespoons of oil in a large, deep skillet. Add the cumin seeds and cook over high heat until they sizzle, about 10 seconds. Add the onion and cook, stirring occasionally, until softened and starting to brown, about 10 minutes. Add the jalapenos, garlic, ginger and red chiles and cook, stirring, until fragrant, about 3 minutes. Add the tomatoes and boil until all the liquid has evaporated, about 8 minutes. Add the paprika and tumeric and cook, stirring, until fragrant, about 3 minutes. Stir in the eggplant and cook over low heat for 10 minutes to blend the flavors. Add the peas and cook 5 minutes longer. Stir in the chopped cilantro and the yogurt and season with salt.